House of Mutt Blog » Podgers, porkers, chunkies – or just ‘comfortable’? The overweight debate continues…. Podgers, porkers, chunkies – or just ‘comfortable’? The overweight debate continues…. 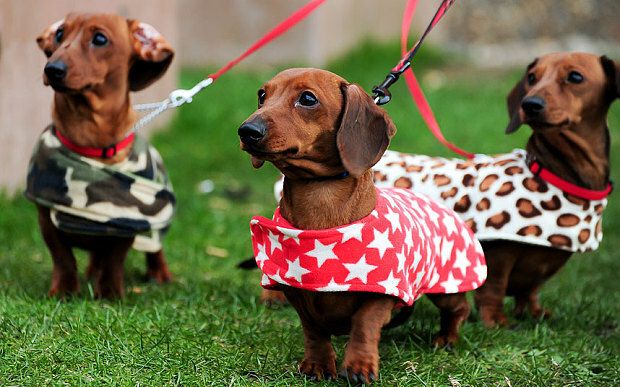 Apart from being slightly amused to see that in the picture used to illustrate the ‘healthy-weight dachshunds’ , all three are wearing long coats (which everyone knows are useful garmets for troublesome ‘fat days’! ), there are no real answers in these articles – but they’re interesting to illustrate the debate that is currently circulating in veterinary circles about obesity in dogs. For my view, less is more. Not always easy to achieve I know but, as fillers of the family dog bowl, it is something we can control. It’s a fairly easy job to glance at an eager waistline waiting at your feet at feeding time, and adjust the ‘handful’ going in to their bowl accordingly. Got that sussed; now just need to apply the same subjective mentality to my own plate…. !